Eric Hanushek is the Paul and Jean Hanna Senior Fellow at the Hoover Institution of Stanford University. He is a leader in the development of economic analysis of educational issues. He has authored numerous, highly cited studies on the effects of class size reduction, high stakes accountability, the assessment of teacher quality, and other education related topics. He introduced the idea of measuring teacher quality through the growth in student achievement that forms the basis for the development of value-added measures for teachers and schools. Most recently, Hanushek shows that the quality of education is closely related to national economic growth. His most recent book, The Knowledge Capital of Nations: Education and the Economics of Growth, identifies the close link between the skills of the people and the economic growth of the nation. His prior book, Endangering Prosperity: A Global View of the American School, considers the performance of U.S. schools from an international perspective and identifies the costs of not improving student outcomes. His prior book, Schoolhouses, Courthouses, and Statehouses: Solving the Funding-Achievement Puzzle in America's Public Schools, describes how improved school finance policies can be used to meet our achievement goals. Earlier books include Courting Failure, the Handbook on the Economics of Education (four volumes), The Economics of Schooling and School Quality, Improving America’s Schools, Making Schools Work, Educational Performance of the Poor, Education and Race, Modern Political Economy, Improving Information for Social Policy Decisions, and Statistical Methods for Social Scientists. His numerous scholarly articles on a wide range of education topics are very widely cited both in professional journals and in policy discussions. He is chairman of the Executive Committee for the Texas Schools Project at the University of Texas at Dallas, a research associate of the National Bureau of Economic Research, and a member of the Koret Task Force on K-12 Education. He recently served as a commissioner on the Equity and Excellence Commission of the U.S. Department of Education. 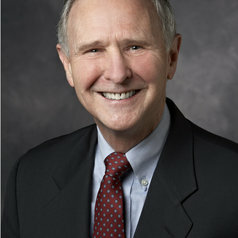 He was chair of the Board of Directors of the National Board for Education Sciences during 2008-2010. He is currently the area coordinator for Economics of Education of the CESifo Research Network. He previously held academic appointments at the University of Rochester, Yale University, and the U.S. Air Force Academy. Government service includes being Deputy Director of the Congressional Budget Office, Senior Staff Economist at the Council of Economic Advisers, and Senior Economist at the Cost of Living Council. He has been appointed to a variety of policy commissions including the Governor’s Committee on Education Excellence in California and the Governor’s Commission for a College Ready Texas. He is a member of the National Academy of Education and the International Academy of Education along with being a fellow of the Society of Labor Economists and the American Education Research Association. He was awarded the Fordham Prize for Distinguished Scholarship in 2004. He is a Distinguished Graduate of the United States Air Force Academy and completed his Ph.D. in economics at the Massachusetts Institute of Technology. He served in the U.S. Air Force from 1965-1974.